An international group of 11 European meetings and events buyers and one journalist from a relevant UK media joined the trip to discover Bratislava, the capital of Slovakia for educational MICE immersion on a 3-day familiarization trip from 9th to 12th of August. Bratislava Convention Bureau together with the members and partners prepared a rich program which included site visits to hotels and venues. The participants got to know the historic city center of Bratislava and experienced how Bratislava is a boutique, intimate capital with a deep imperial heritage. They also visited its surroundings and got the taste of the Slovak culture, culinary, tradition and of course the Slovak people. Many old and modern venues were visited: the 96m high UFO Tower, the Nedbalka Gallery also known as the “Slovak Gugenheim” gallery, Wiegerova Villa, Thetor equestrian center, the Slovak Ring and the castles. Besides that, a wide range of incentive activities were demonstrated for the participants on and off the ground. 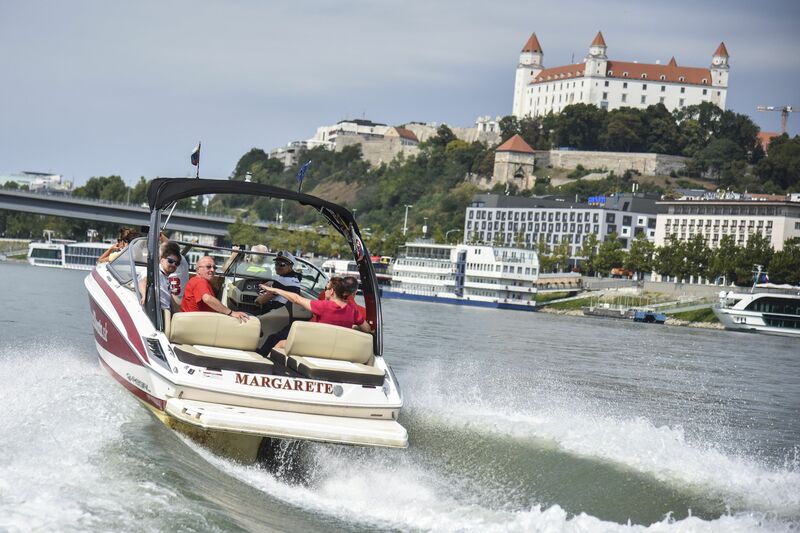 A trip to the Speedboat on the Danube river, wine tasting at in wineries and castles. A visit to the Old Market Hall and many examples of old and new heritage were presented to prove that Bratislava can provide a stimulating event backdrop. Bratislava is re-inventing itself as a “Motor city” due to its large automotive industry. And therefore the group also did a test driving on the Slovak Ring, to get a taste of FIA WTCC and it’s meetings potential. The x-bionic sphere in Samorin, the world-class sports, and innovation complex, specializing in equestrianism and football, in particular, was presented in all of its capacity as a full-service resort facility for conferencing on a sports theme and more. The participants also had B2B events planned, where the buyers met the representatives of Bratislava hotels and some of the venues and of course the CVB team. Some things just can’t be described in words, so take a look at some photo impressions from the fam trip.